The easiest scenario is when you are creating pieces from plate materials which are to be milled completely. That means that first the drillings will be milled and inner pockets, where appropriate. The last step of the process will be the milling of the outline of the piece and the piece will thereby be completely removed from the plate. There will be a thin frame and some leftovers remaining from the raw material. There are many applications for which you can use this principal. The benefit of this type of processing is that it does not depend on the precise positioning of the material. As long as the milling or cutting path lies completely within the raw material, the pieces will always fit accurately. Only the Z-height must be adjusted. If there are no pocket holes or pockets and there is a sub-plate positioned beneath the material, this does not have to be done particularly accurately. For two dimensional pieces, this will usually open up very quickly, and a graphic window will display the preview of the tool path. The image above shows an example of a sheet metal part with several drill holes and recesses. Cutting paths along the contours will usually be shown in green (with different tools, the colours may vary), rapid movements will be shown in broken red lines. The position of the zero point will be highlighted with three arrows in red, green and blue. The program’s source text will be displayed in the text window below. Usually, there will be comments in the first column with the name of the part and potentially further information on the creation date, tools used and other similar info. You may see one or more error messages in the „Messages“ window on the right. 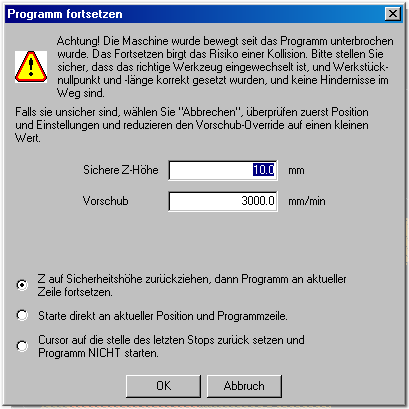 If you see the message „Figure outside permitted range“, this is no cause for concern, just a notice that the zero point of the drawing is not yet aligned to the positioning of the work-piece in the machine. Part of the tool path may lie outside of the positioning ranges of the positioning drive. 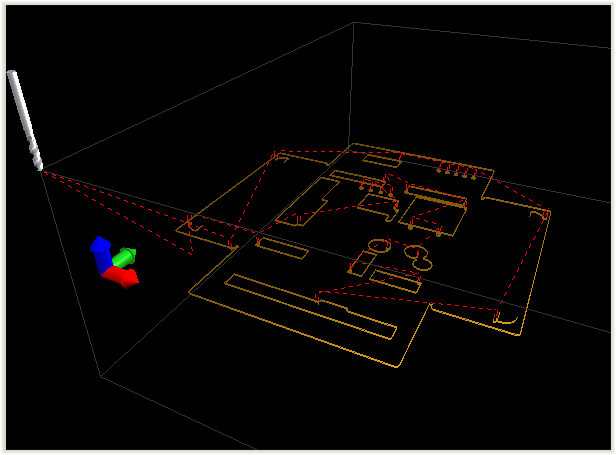 In the example on the right, the tool path protrudes over the machine’s working area boundaries on the right, which is displayed as cuboid with grey corners. The tool path area which impinges on the boundaries is represented in orange. X=200,263 exceeds the upper limit of 200. You can tell from the first line that the coordinates in the NC program (G code in the program window) are programmed to a position of 200.263. The updated settings will only allow the X-axis to go up to a value of 200. The second line gives more detailed information about why this is: The currently selected zero point is G54. The off-setting of the zero point is 200. The absolute upper limit for the X-coordinates (as they are set in the machine’s parameters) is 400. The program’s x-coordinates (200.263) plus the offset equal a sum which exceeds the limit. The third row indicates the error within the program in the text. The point is then also indicated in red in the „program“ window on the left. As you can see from the image, the processing area extends out of the machining area to the right, and has to be shifted to the left, i.e. in the direction of a lower X-value. In the following description, it is assumed that the zero point in the image, like in the example in the picture, is positioned above on the upper side of the material and in the X/Y direction below on the left. 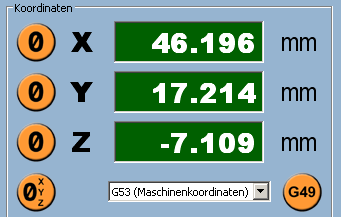 If the coordinate display on the screen still has a green background, then that means that no working part offset has been selected and „G3 (machine’s coordinates) are displayed under the coordinates. First, select an offset, e.g. 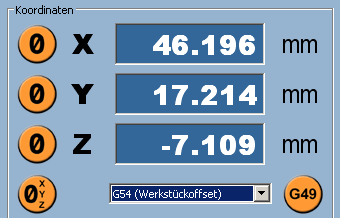 „G54 (working part offset)“. The coordinate display changes to a blue background colour. After you have secured the material on the table, use the hot keys (numeric keypad) or the toggle buttons on the setting site to get to the point where the work piece zero point should be. If you have just turned on the machine, a warning will appear to that no reference drive has been carried out yet. Select „reference drive now“ and go to the desired position. The cutter tip should be just above the surface of the material and in the X/Y direction, somewhat inside of the lower left corner of the material. Now press the „All zero values“ button on the left by the coordinates display. On the main page in the graphic, you’ll find the tool (light grey cylinder) on the zero point position (arrow with three colours), and the tool path should have the desired position in the machining area, i.e. should lie completely within the permitted borders. You will know this when no part is marked in orange any more and all the lines lie within the grey cube. There should be no more error messages in the message windows, just „use the zero point…“. You can now perform a fine adjustment of the zero point, e.g. with the paper method as described in the „Set the Zero Point“ chapter. If your piece contains blind holes or pockets and you need to precisely define what the depth should be, you must of course subtract the thickness of the paper from the Z-coordinates offsets. When you know this thickness, (e.g. measure it with a callipers) you can bring down the Z-axis slowly and carefully and then press the Zero Button for the Z coordinate once more. However, it is better not to risk any tool breakage and simply enter the figure directly. 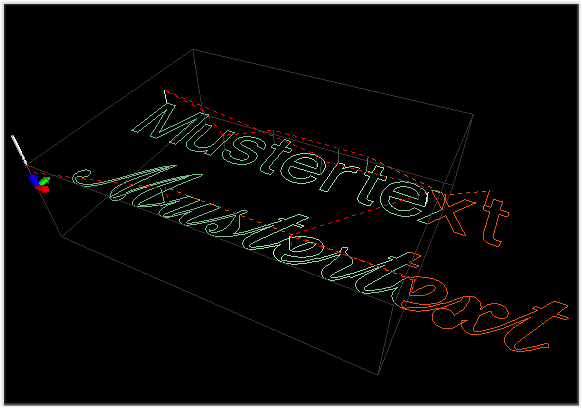 First, double click on the Z coordinates display and enter for example „0.1“ in the pop-up window which appears. The zero point will then be 0.1mm deeper than the current position of the cutting tip. This also prevents any risk of the surface of the material being scratched. When the zero point is correctly set, the graphical display of the tool path is represented as expected and there are no further error messages in the message windows, you may start the program. The button (4) to do this can be found on the main page („program“) on the left below the graphic window. In the event that an error message is displayed, or the text display (the „program“ window below the graphic) is not displaying program start, it may be that the Start Button is locked (greyed out). In this case, you can first click on „rewind“ (9), then the text display will jump to the Start program and the Start Button should be active again. Before starting a new program for the first time, it is recommended that the Feed Override (Slide control bar „Feed %“ above right) be set at a low value (e.g. 10-20%), so that the machine runs slower. If you have made a mistake while setting the zero point, or the wrong tool is in the spindle, or the machine makes an unexpected movement at the wrong position, then one has time to react to a potential collision. Press the Stop Button (<) to stop the program, or in an emergency you can of course press the Emergency Button on the machine. If everything goes to plan and functions without problems, then you can set the Feed%-Slide control bar back to 100%. If you encounter problems while processing, e.g. the tool is covered in shavings, or the tool breaks off and has to be changed, you can stop the program being carried out at any point, by pressing the Stop Button. After a short delay, when the spindle motor comes to a standstill, the Start Button will become active once more. After you have resolved the problem, you can continue to work again on the same spot. If the tool has broken, it is possible that the control has allowed a part of the program to continue, while the (broken) tool was not in position. In order to retain the entire tool path, you will have to rewind this part of the program. According to how far along the program has run after the breakage, you can scroll up a few rows in the text window to the desired row and mark it by double clicking. The Start Button on the left will be deactivated (greyed out) and the second button (4N…) on the right will become active. If you use this button to start, a window will appear containing a warning as the image on the right shows. Continuing a program at any given point, depending on the type of the piece, the tools and the processing strategy does represent a certain amount of risk. In extreme cases, for example with a T-slot cutter, which is positioned in the middle of the material, continuing in this position is absolutely impossible without damaging the piece or the tool. Because the control is not capable of detecting these kind of risks, the responsibility in these types of situations lies with the user. You should take into consideration that the tool proceeds with all axles in simultaneous motion to the next processing position, potentially in certain cases diagonally. It could transpire that on the way there, you may encounter some unprocessed material. If you cannot guarantee that it will not end in a collision, rewind until you reach a risk-free point, e.g. a groove or pierced spot of a safe Z-height outside of the material. For shorter programs which only run a couple of minutes, and if the piece is not too valuable, continuing is probably not worth it and it is better to start the program again from the top instead of risking another tool breakage. In the title row above in the main window, the name of the program currently loaded will be displayed. In the status bar right at the bottom on the right, the Row Number is displayed, showing how far along the process has progressed. If you interrupt a program, and want to continue again the following day, it is recommended that you take note of this row number so that you can find the correct point to continue from. On the right, in the preview after the program has loaded, the estimated time for processing and while the program is running, you will see the time already completed. On the Diagnosis Page, below in the „Statistics“ box, the operational hours and part counters are displayed. The operating hours and the user clock are always running when a program is being executed. The Parts Counter will increase by one after every completed execution of a program. The user clock and the parts counter can be set again to zero if required. 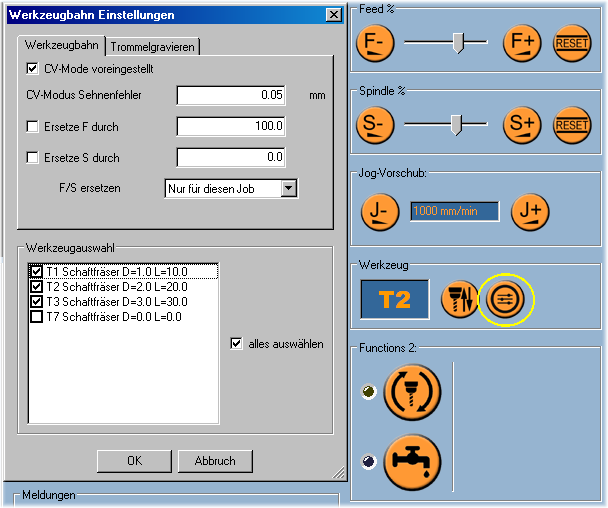 On the right of the Tool Display (in the right-hand column of the main window) there is a button for the Tool Path Settings. This can be useful to influence the sheet tolerances (sewing errors) or feeds and spindle speed after the event, without having to change the machine parameters or to have to process the program in text editor. 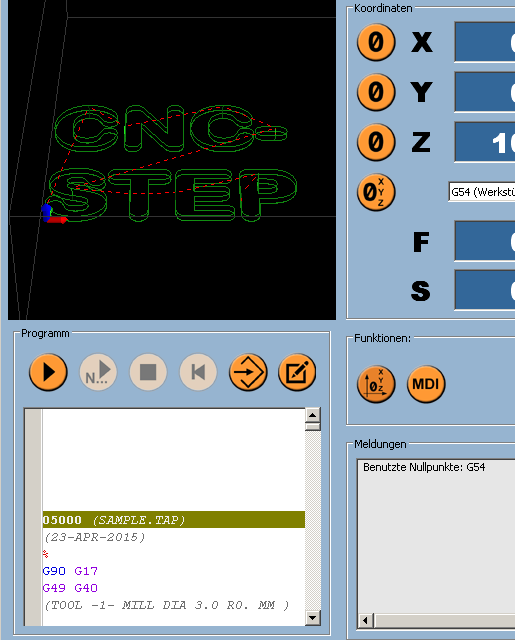 If the program includes several processing steps with a variety of different tools, you will be shown a „Select Tool“ menu. You may exclude certain stages or select only one of them.